Sacramento Mayor Darrell Steinberg expressed confidence last night on the city's prospects of landing an expansion franchise of Major League Soccer. Steinberg made the comments as the featured speaker at Region Builders BBQ in the Stadium dinner event held at Cal Expo. Region Builders is part of the Sacramento-based Region Business construction and business advocacy group. Speaking to an audience of close to 1,000 people, Steinberg recognized the role Region Builders played in keeping the Sacramento Kings from relocating and the construction of downtown Sacramento's Golden 1 Center. 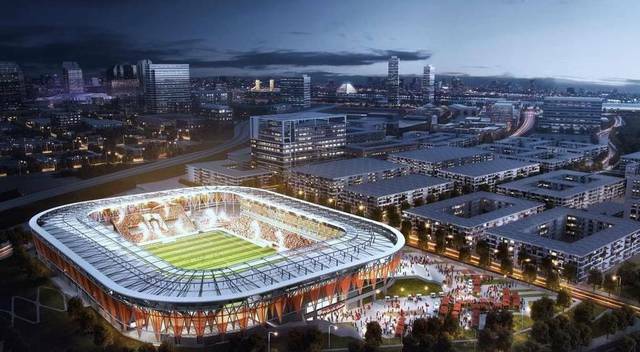 Following those comments, Steinberg quickly pivoted to the city's pursuit of an MLS expansion team and a proposed new stadium in the Sacramento Railyard development on the north side of downtown. As part of the event, Steinberg noted guests would also be attending the soccer match at Papa Murphy's Stadium at Cal Expo between Sacramento Republic FC and Real Monarchs of Salt Lake City. "Right now it is not Major League Soccer, but enjoy the great minor league stuff while you can," he said. "Because pretty soon Sacramento is going to be a Major League Soccer city." Steinberg went on to say "we are not over the finish line yet and there is lot more work to do," but said the prospects are looking very good. The redevelopment of downtown Sac is great for the construction unions and the well-heeled developers and landlords. Everyone else? The resulting gentrification of the people forced out by rising rents will definitely have an impact on the surrounding suburbs. But hey, give Steinberg a feather for his cap, for he's a jolly good fellow!